I love the Fallout series, I have played them all...a lot. And I am eagerly awaiting Fallout 4, truly the best birthday present I can think of. So, in celebration of Fallout Shelter coming to android in a few hours, I thought it would be fun to have a poll about what sort of jacked-up vault I should create. I picked five from this list that I was most interested in doing and will leave it to you all to decide which I should do first. If you have a really good idea that is not listed, put that in to. I will probably write up some sort of article about how poorly it goes in the future, but no promises. One of the easiest and most straightforward experiments to conduct is the single-gender vault. Populate your entire vault with only male or only female vault-dwellers, depending on your preference. Everyone else gets sent out into the wasteland either to collect resources for your vault, or to die, depending on how dark you want things to get. Variation: a ‘normal’ vault where every single baby has the same father. Lots of people are doing this one. Having the dude wear a pope suit is particularly popular. Every vault-dweller has to earn their place in the vault. Before you take in the dweller permanently, send them off into the wasteland for a set period of time. The stipulations from here can be up to you. Maybe the dweller has to survive for one hour without any weapons. Maybe they get a weapon, but no stimpaks or radaways—and they have to make it for an hour. Pretty straightforward. Dwellers with low stats get sent out into the wasteland, either to die or to gather resources. Your call. Remaining dwellers all use stat-boosting rooms, to improve their skills. Your vault exists to produce the most resources possible. 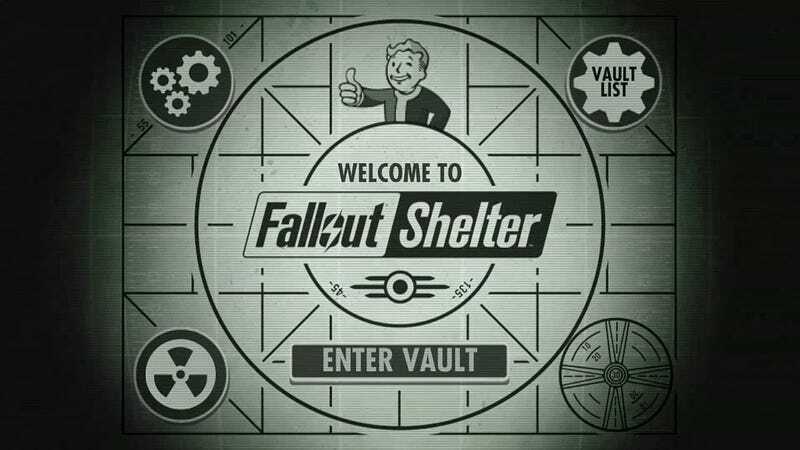 In addition to placing dwellers in the most appropriate station per their stats, every time you boot the game up, you will perform one rush in every single room available to you. If you’re particularly serious about it, you can keep doing rushes until the room actually succeeds. To help this playthrough out, you’ll want to upgrade your rooms as much as possible, for better gain. You might also want to consider building stat-boosting rooms, so you can buff up production.